Small businesses must make a concerted effort to not only create the sales of as many of their products and services as possible, they must also do all they can to lower costs. These two factors combine to create a company that is profitable. In terms of lowering costs, companies need to closely examine how they operate to find areas where they can save. Here are a few areas where companies can focus to make sure that they are not paying more than they should for the goods and services use. Many businesses still use printed marketing materials to present their businesses to prospective and current customers. Printed marketing materials offer an ability put something in the hand of someone giving them a tactile feel for the products and services being offered. As these types of presentations have gone on line, which has a minimal cost, companies are becoming reluctant to spend money on the hard copy versions. But business cards, flyers and catalogs and brochures still very effective marketing tools and should be considered seriously for use by nearly every company. Small companies however must be smart about purchasing these items because high quality versions of items like brochures can be very costly. For this reason, small companies must shop around and locate great brochure printing deals that deliver great brochures at low cost. They should also be selective about how and when to provide printed marketing materials. This should be a part of a marketing strategy that includes traditional and digital marketing. Today there are companies that lease practically anything you will need for your business. Small companies can purchase office furniture, office equipment, and even tablet computers and mobile phones on lease. The benefits of leasing is that you can get the latest products, avoid the purchase price and in many instances have them automatically replaced with newer versions on a time schedule. When you lease, you must make sure the price you pay is the right one and the terms are fair with no hidden fees or charges. Leasing means that when you return the item it must be in great condition considering the expected wear and tear. In terms of electronics do not take leases longer than 2 years because they can be outdated if taken longer than that. You want to have the latest models of anything you lease. Temporary workers should be considered as an option for all small companies. Today companies essentially lease workers to a company for projects on a temporary basis. The worker will arrive at your business trained for the job you need and can immediately produce for your company. The taxes and other important s aspects of hiring an employee is handled by the company providing the worker so the small company does not have to concern itself with it. When the project or term is finished the worker simply stops working at the small company. Quick and easy and trained employees precisely when they are needed and only for as long as they are needed. Utilize one or all of these ways to lower your company costs and improve your bottom line. Apart from the right control over the trading management, the traders also have to think about trading methods. It is the system of getting on with a trade. The only main factor of this concept is that the traders will have to think about a decent timeframe for the trades. That will be helping you in a lot of ways. Just think about getting a proper timeframe for doing the right market analysis. From there, you will be able to make the right selection of the position sizing of the trades. Then there will also be some good control over the closing points of the trades. That is because the traders will be following rules for all of the trades. Choosing the right stop-loss and take-profits will be in there. So, there is no better way develop a good performance in the currency trading business than to follow some proper rules and regulations. That is what, the traders will have to be learning from this article about. We are going to try our best for teaching you about the proper way of selecting the right trading method for your business. The most important and first thing to do for the trades is to build the right mindset. When a trader will have too much money making intentions inside his or her mind, there is no way to make the right performance in the business. That is a fact for all of the traders. And making money is not the only thing for currency traders. As you are going to be making the business happening with your money, it is not safe to think about profits. The high volatility of the markets of Forex will not let you win all the time. Having a desperate mindset will make you even more unpleasant for some good performance. The results from the trades will definitely make some worse impressions for the trading account balance. So, the traders will have to think about the right motto of the trading business in here. New traders don’t really know how things work in the Forex market. They simply take unnecessary risk and lose a significant portion of their investment. At the initial stage, you need to use the demo trading account from Saxo to master the art of trading just like the professional traders in the UK. There is no reason to risk your real money when you can master new things without risking any real money. Stick to the basic rules of investment and you will be able to protect your trading capital. When you are done with making the right perspective for the business ready, it is time for the selection. The trades will have to be designed in the right way. Choosing the most pleasant trading process is the right way for the currency trading business. Just think about some proper relaxation in the process. There will not be too much for your mind to deal with. We are obviously talking about the long term trading process. When the traders will be selecting either of the swing trading or the position trading system, there will be some good performance happening. They help in both the market analysis and the position sizing of the trades. Then there will also be some good experience with the closing of the trades with proper tools. So, you are being safe with them almost all of the time. Even with some proper selection of the right trading process, like swing trading, there can be some mistakes. We are talking about the frequent trading process or overtrading. The traders will have to forget that for a decent performance and saving your business and trading capital. If you are on Windows, you can use Microsoft Word to edit your PDF document. It will not allow you to edit it in PDF format but it will convert your PDF into Word format instead. Although Word can import PDF document, it tends to mess up the formatting, for example, oversize headers, and adding spaces in between the paragraphs. In Microsoft Word, you can open a PDF just like any other word document by going to File > Open. Alternatively, you can right click on a PDF and select Open in Word. The styling can be fixed by first selecting a section to find out what style it is using. Next, you must edit the messed up style to resemble the style of the original PDF document. By doing so, the messed up style used in the rest of the document will also be updated. While Word can import a PDF form, it cannot import the data that is entered in the fields. Besides, it will also mess up the formatting of the form such as spacing, and text boxes. If you press the save button, it will be saved as a Word document by default. However, if you want to save it back as PDF, you can do so by selecting the File tab and choosing the Save as option. Before clicking the Save button, you must choose the PDF format, and enter the file name. Another way to export it as PDF is to choose the Print option from the file menu. In the printer drop down menu, you must select Microsoft print to PDF. If you find it troublesome to use Microsoft Word, you can use a third party PDF editor tool like Movavi PDF Editor to edit your PDF document. You must enter into the Edit Objects mode to edit text paragraph or images in individual pages. The software also let you append images as an extra page in the PDF by clicking the Append Files button. The rotate tool can rotate the text/image by 90 degree to the left/right or 180 degree. You can delete any text block or image in the individual page and replace with another one. The copy/paste features allow you to conveniently copy/paste an object in the PDF from one page to another. Get more details at pdf.movavi.com/index.html. The software also support opening fillable PDF forms. Once opened, you can place your cursor on the blank field and type in the data directly. Every editable object is resizable in the PDF. You just have to select it in Edit Objects Mode and drag the corner of the outline to resize it. You can alsod drag the text/image around to change the position in Edit Objects mode. The software supports 2 modes including view mode and pages mode. 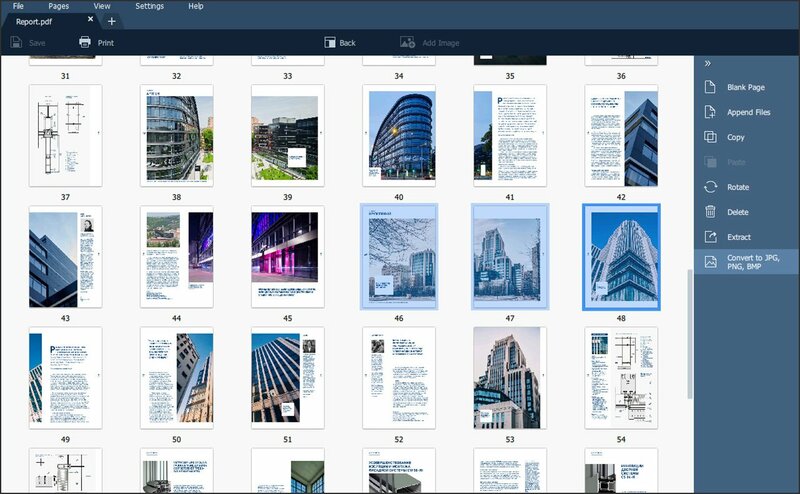 View mode will display the PDF documents in thumbnails on the left side bar and let you preview it on a large preview screen on the right. In View mode, you can access the editing features by right clicking on the thumbnail. Pages mode is best for rearranging the PDF documents. Whether you own a small home-based business or run a multinational company, most business owners will tell you that they constantly have to check on their health. Running a business can be taxing, and we often neglect our own personal wellbeing to reach business objectives. But there are some simple things that any business owner can do to make sure that they, and their business, remain healthy. Here are a few of them. Sleep is when our minds and bodies get to “reboot” and get some rest. While you may think that squeezing as much as you can into your working hours is best for your productivity, not having enough sleep can actually be detrimental if you’re trying to be more productive. Lack of reparative sleep will decrease your mental capabilities and will make you less alert and affect your performance at work. While there isn’t a single number of hours you should sleep each night, you should aim at something between 6-8 hours of sleep if you want to be able to run on all cylinders. What you eat will also have a huge impact on your performance and overall health as well. Constantly resorting to less than healthy fast food to save time or stress eating junk food certainly won’t help. Make sure you stock your diet with plenty of good protein, complex carbs, and high nutrient foods. One of the best ways you could do this would be to prepare the food yourself. This will allow you to control things like sugar and sodium, for instance. If you feel you don’t have the time to cook, consider taking one day each week to do some meal prep so you can cook all of your meals at once and portion them. This means you’ll always have a healthy meal ready to go. Getting a gym membership isn’t something all business owners can do and finding time to get the amount of daily exercise you need can be a challenge. But you don’t necessarily need to spend two hours in the gym each day to get the amount of exercise you need. Something as simple as doing a couple of sets of jumping jacks at different points during the day could be more than enough to get your blood pumping. You should also consider investing in an activity tracker. They will allow you to calculate things like the number of calories you burn each day, sleep time, and the number of steps you walk each day. Walking is one of the easiest ways to incorporate exercise into your busy day. You could either go out for walking breaks or simply change some of your habits. For instance, you could take the steps instead of the elevator to get to your office. Or get a parking spot a few blocks away. This will force you to walk more each day and will do wonders to keep you healthy and happy. These few simple tips should be more than enough to get you started on your path to a healthier you. Make sure that you follow them to the letter if you want to be as healthy as possible and have the energy needed to run a successful business. The world is changing, and so are the ways in which companies do business. Today, in the era of globalisation and technology developments, companies use the digital channels on a daily basis in order reach new, potential customers. From email marketing, social media and the company website to search engines such as Google – a successful business must be able to navigate smoothly across all of the digital channels. One of the greatest benefits of the technological developments and globalisation is the fact that today, businesses from any virtually sector can acquire new, international customers relatively easily - something that even only 10 or 15 years ago was not only tremendously difficult, but also due to being awfully expensive, was somewhat exclusive to large organisations. Expanding into foreign markets, or even approaching international customers in your home turf, is, although simpler than ever before, still easier said than done. In order to do this successfully, a business must take vital steps which will increase their chances for success. In this article, we will cover some of the factors which are vital during an international expansion and approaching foreign customers. One of the most essential elements of internationalisation is fully understating the market you wish you target. Whether it’s your home market or a market abroad, being able to recognise its particular principles and driving factors within it will consequently allow you to position your business more effectively. It is critical to understand who your competitors are and what the market saturation of products/services similar to yours is. Too often, business owners decide to penetrate a foreign market without conducting a prior research, and consequently find themselves in a place which is flooded with product/services similar to theirs at better rates and from competitors already established in the country. A prior market research will allow you to decide whether the market you wanted to target initially is truly a good fit for your company. In a saturated market with plenty of competitors, your products/services may not cut through the noise. In such case, it’s advisable to explore other options, markets and countries for your company to expand to. The importance of conducting a market research has been highlighted numerous times by some of the leading business analysts and personas. Rosana Mirovic, who is head of SME policy at the Association of Chartered Certified Accountants, stated for The Guardian that “The first step is always to do plenty of research” and we couldn’t agree more. You can read more of Rosana’s advices regarding international market research here. Being able to understand your potential customers is perhaps equally crucial to the previous point. There are many different aspects, which can influence how a consumer behaves and factors which can directly, or indirectly, affect their shopping habits. By conducting an in-depth research into these very factors and fully understanding what drives the consumers you wish to approach, your company will be able to plan, create and adjust both marketing materials as well as products and services to better suit the requirements of your potential customers. Approaching a new market and consumers is a difficult task even on your home ground, and so when approaching a market abroad, the task becomes even more problematic. The differences between what you know and what your products/services are adjusted to may be very different to what the international audience expects. From social, economic or geographical to political and religious factors – all of these aspects must be considered when planning an international expansion. Professional translations are a factor, which over the recent years became very significant during business expansion. As a growing number of businesses decide to ditch the old fashioned ‘one-fits-all’ approach and choose to localise their message for each key market they target, translation agencies are becoming a natural business partner for many organisations. Although international markets may differ in terms of the previously mentioned socio-economic, religious or political factors, they do have something in common; anywhere in the world consumers prefer to be approached in their native language. In order to successfully target the international audience, a business should evaluate its marketing materials and translate them professionally with the help of a translation agency specialising in business translations. From websites to brochures, business cards and even social media – translating such materials can significantly increase a company’s chances for success within an international market. To give you a more detailed and reliable assessment of this statement, we’ve asked a representative of a leading London translation agency, Translation Services 24, whether in the recent years there had been a growth in the number of companies requiring their language interpreting services. According to TS24, the perception of translation services is positively changing amongst business owners and consequently the growth in demand for business translations is clear to see. Today, in a globalised world, companies understand and are aware of the importance of language in business and both, short and long term, benefits working with a translation agency can bring to their operations. Nowadays, a translation agency is an important partner within the business operations of an international company and often translation services are incorporated within yearly budgets. Can a translation agency help with anything else? Working with a translation agency can be beneficial for businesses not only from the marketing, branding and sales point of view, but also from a legal perspective. When approaching new markets, it is often essential that any legal documents are easily understood by prospective business partners and clients. Contracts, terms and conditions and even warranties should be professionally translated when dealing with international clientele in order to avoid any confusion and legal misunderstandings. As you can see, approaching international markets and consumers is still a challenging task for businesses. It is essential to prepare a detailed plan exploring in-depth not only the chose market, but also the potential customers and factors affecting their behaviours. Additionally, working with translation agencies which specialise in translating business materials, whether marketing or legal in nature, is becoming an integral part of internationalisation and increasingly popular amongst business owners and infopreneurs from all sectors. Incredibly, the UK’s gross pension liability grew by £1 trillion between 2010 and 2015, with the Office for National Statistics (ONS) revealing that total peaked at £7.6 trillion three years’ ago. This includes both state and workplace pensions, with private and public sector entities struggling against the backdrop of austerity and a volatile economic climate. If you have underlying strong knowledge of the financial market and want to make personal pension savings, however, self-invested personal pensions (SIPPs) may offer the ideal solution. Here are some reasons why it may be beneficial for you to transfer your pension to a SIPP. One of the biggest benefits of a SIPP is that it offers access to a wider and more diverse range of investment opportunities. This includes both domestic and international assets, which can help to create a balanced portfolio that accumulates wealth over time. This only really applies if have a clear understanding of specific investment markets, however, and are able to leverage this greater range of choice to your advantage. SIPPs are also unique in that investors can assume far greater control over their funds, and the individual investment decisions that are taken on the portfolio. This is not the case with standard pension funds, which typically do not allow individuals so much control over decisions regarding the deployment of their contributions. If you have knowledge of a specific market or asset class, you can use this to realise the full potential of a SIPP and gain a distinct competitive advantage. We’re increasingly likely to change jobs in the current labour market, largely in the pursuit of career development and competitive salary. This can leave you with several workplace pensions, however, making it exceptionally difficult to manage your funds over a sustained period of time. SIPP providers such as Bestinvest can help in this respect, as they allow you to transfer existing pension funds into a single, self-invested plan. They may also cover some of the charges associated with transferring your funds from an existing account, reducing the cost of managing your pension pot in the process. Although there are benefits to this practice, just be sure to check to terms of your existing pension funds before completing the transfer. After all, you may lose valuable benefits if you transfer and this would prove to be entirely counterproductive. Investing in composite materials can be done in several ways. You can build (or buy) a business that produces composite fiberglass products or you can use fiberglass composite materials for your home. Either way, it’s an investment. It’s used in so many industries. And people are still finding new ways to make use of it. It may seem that the use of fiberglass composite can be somewhat expensive at first. But don’t look at the cost of the materials. Its lightweight property means that it’s very easy to install for many applications, and that means that you can cut down on labor costs. This has been demonstrated in many construction and highway infrastructure projects. Its cost-effectiveness is also one of the reasons why it’s the most popular insulating material in the whole world. Fiberglass composites can be so strong that their specific tensile strength is greater than that of steel wire. This means 2 things. You can get the same weight of other materials and now you end up with something that a lot stronger. Or you can go for the same strength but now your product is so much lighter. Both approaches have their own sets of merits. Even with adverse conditions like heavy loads, fiberglass composites don’t elongate or stretch. They don’t shrink as well. What this means is that you get the same performance even with rough handling. Basically, you can mold and design it in just about any shape or design you want. You can manufacture it with the sort of finish or color you wish, and it can be any size. It’s why so many manufacturers and builders are going for fiberglass composites. These fiberglass composites aren’t flammable. It uses inorganic materials, so there’s no carbon at all. This is why fire blankets are generally made of fiberglass fibers. Its heat resistance is also terrific, which is again why it’s used for insulation. Fiberglass fabrics can retain 50% of its tensile strength even when the temperature goes from room temperature to 371 degrees C (about 700 degrees F). At 482 degrees C (almost 900 degrees F), it still has 25% of its tensile strength. You’ll need 846 degrees C (1,555 degrees F) to begin softening fiberglass. To completely melt it, you need a temperature of 1121 degrees C (2,050 degrees F). What this basically means is that fiberglass products can be very durable. They’re replacing steel in many ways because they don’t rust. They’re also replacing many plastic products because plastics don’t last long against strong sunlight. Their resistance to harsh chemicals is why they’re used to make pipes. They can be used outdoors for furniture, and they won’t be affected by sunlight or the rain. Termites can’t get at them either—they’re inorganic, so they can’t eat it. So fiberglass is simply a very good investment. They’re in high demand, and you can provide the supply to create a tidy profit. Or you can use it for your products, and get a reputation for long-lasting products that consumers love. Business can often be cutthroat in nature, especially in some of the more competitive industries like retail and hospitality. As such, it is up to small businesses to make sure that they are giving customers enough reason to spend money on their products/services, and to do as much as they can to generate repeat custom. Nowadays, there are plenty of innovative (and cheap) ways of going about this, but it is often the simplest, most tried and tested methods which work the best. As such, here are some of the benefits which help to attract customers. There are no two ways about it, everyone loves a good deal, and so applying deals as and when appropriate can go a long way in helping draw customers in. These could be seasonal, such as reducing the price of certain products at a certain time in the year (e.g. summer clothes in summer), which is sure to help shift stock during that time period. They could also be more regular, such as discounting certain products when bought in conjunction with another (or even offering two-for-one where possible). It is important to emphasise USPs when offering deals, and to make sure that they are different from any being offered by competitors. One of the key components of any effective and functional business, customer service, has always been a cornerstone of overall customer satisfaction. For insurance businesses, for example, good customer service means offering continued help and advice as soon as the client has taken out insurance, and ensuring that there is always someone on hand to help answer queries relating to their policy. Customers who receive good customer service are far more likely to recommend the business to their friends and family than those which don’t, and recommendations invariably lead to gaining more customers. It would be futile to ignore the fact that, no matter how good the deals or customer service, the service or products which a business offers need to be top notch. In a competitive world, quality really does count for a lot, and those businesses which stand out from the crowd are sure to bring in more customers. This goes for businesses of any kind. A business which offers loans to clients, for example, would need to make sure that the interest rates which they offer are both fair and competitive compared, and that they are targeted towards the needs of their potential customers. Good products/services will also go a long way in helping to boost the natural marketing known as word of mouth. There are many other ways to bring in customers, but focusing on the basics is always a good place to start. Those businesses which manage to perfect these stand a good chance of earning themselves repeat custom and boosting their growth as a result. It is still important to remain innovative and open minded, as the benefits which a business offers must still be fresh and different to keep customers interested in the long run. If you are lucky enough to enjoy all the benefits of working from home, then you'll want to make sure your office space supports your work needs as well as reflecting your personality. When designing your home office take some time to browse magazines and websites for inspiration but combine the ones you like with a pinch of practicality. Quirky desks and chairs may look great but if you are spending several hours a day sitting on an uncomfortable chair or working at a desk that is simply too small, you may regret your initial choices. If you are lucky enough to have a window looking out onto a great view, then be sure to place your desk near it. You will benefit from the natural light as well as having an inspirational outlook that rests your eyes and recharges your brain. Even with a window, there will be times of the day or year when extra lighting is needed. Be creative with this and as well as a bright overhead light, invest in a couple of striking contemporary spotlights that give character to your office as well as adding versatility to your workspace. Working from home always generates lots of paper and office stationery and accessories but also gives you the opportunity to be creative with your storage space. Instead of relying on functional but boring filing cabinets, search out quirkier alternatives or design custom-made shelving that perfectly matches your storage needs. If part of your day is spent reading reports and there is space in your office, then why not invest in a comfortable and attractive armchair? You've got the basics in place and have created yourself a functional and comfortable workspace. Now you can add those little extras that really make the space your own. Green plants draw in oxygen and are relaxing on the eye while a regular supply of fresh cut flowers in statement vases brings in a touch of colourful nature. Use your [URL='https://www.voucherbox.co.uk/vouchers/euroffice]Euroffice discount code[/URL] to stock up on your stationery needs, letting them bring another splash of personality to the workspace. Choose one bold bright colour that complements your decor or mix and match your stationery for maximum impact. Your home office is ready to inspire your working day. The field of web development is one of the fastest moving tech fields. New trends and best practices are constantly emerging and evolving. The following trends are those that look set to be most important as we enter the second half of 2018. Websites fall into one of two broad categories. The majority of the websites that we use every day will be of the multi-page type. On a multi-page website, when you click a link to another part of the website, a corresponding page is served to the user. On the other hand, one-page websites consist of a single page with a central frame. As content is called by the user, it is then loaded into this central frame. When the user clicks on something else, rather than loading another page, the content displayed in the frame is simply switched out. With more users than ever before opting to browse on a mobile device (more on that later), it is unsurprising that the one-page approach is gaining popularity. Mobile users don’t want to be eating needlessly into their data allowances, so a one-page site will help to reduce the load. Ever since the first announcement of HTML 5, Flash’s days have been numbered. Love it or hate it, Flash has been there throughout many of our online lives. It is through the use of flash technology that we were first able to embed video players into websites. Our society collectively owes billions of hours in procrastination made possible through Flash animation. However, for a number of reasons, most of them very good, Flash is now on the way out and the transition to HTML 5 is all but complete. Flash is no longer supported or updated, and it is relatively rare to encounter it in the world online these days. To be quite honest, many of us are surprised that Flash has held out this long! Come 2019 though, we’re certain that Flash will be gone completely. In one way or another, most of the other trends in web design are being driven by the ever-growing mobile browsing market. More internet browsing is now done on cell phones than on desktops. This means that website owners can no longer afford to overlook users on smaller displays. Dynamic websites that rearrange themselves according to the device they are being displayed on are the preferred solution. The tools to allow the average non-technical computer user to build their own fully featured website have been around for some time now. However, it is now that the technology is truly beginning to mature. Previously, taking a modular approach to website building gave budding website owners limited options and resulted in a large number of websites that look and feel more or less exactly the same. More modern modular website creation tools are a lot smarter and are designed to produce more individualistic results. For some guidance on the best website building software to use, check out this article which covers 15 of the best choices out there. Any website owner who wants their website to exhibit the best design practices would do well to keep the above trends in mind. Just remember, these are only a small selection of the many, many trends that are constantly appearing. Expanding your business abroad is today easier than ever before. Globalisation, technology and widely available internet made cross-border trading much more desirable and attainable than it had been in the past. UK based companies see this as a great opportunity to approach new, foreign markets, grow their market share and consequently increase revenue. Even with a slight political uncertainty, we can see that the number of UK companies approaching the overseas markets, whether it’s within Europe or even further, is constantly growing. Nonetheless, although easier than ever before, taking your company abroad is still much easier said than done, and several companies, SMEs as well as larger organisations, unfortunately found out the hard way. When approaching international markets with your products or services, you will have to pay a close attention to a number of different factors, which can directly or indirectly affect your chances for success within a foreign market. In this article, we’re taking a closer look at some of them. Culture could be one of the most significant factors when it comes to planning and approach for a foreign market. Indeed, culture may differ not only from country to country, but in some cases from city to city and therefore it is imperative to explore and fully understand the dominant culture within the market you wish to target. Cultural, social, political or even religious aspects can directly affect how your product/service and even company as a whole will be perceived from the consumer’s point of view. Before taking your company abroad, it’s advised to run an in-depth PESTLE analysis, which will allow you to fully understand the country you wish to enter and consequently adjust your services in order to be suitable and appropriate. In many cases, language can be the biggest barrier between a company and the customer, or other business partners. A recent survey shows that over 70% of customers feel more inclined to commit to a purchase if the information about a product or service is available to them in their native language. As a result, in order to be successful, businesses must translate their materials and documents into the market’s native language. One of the most popular approaches to this problem is working with a professional translation agency which specialises in providing business translation services. Such agencies are able to cover a wide range of languages and work with content from a number of different business sectors, such as legal, marketing or technical, and guarantee highest quality of work, which is essential. An accurate translation is vital for a business approaching new markets. In many cases, the company’s website will be the first point of contact between your business and potential customers, consequently in order to uphold a professional image of your company, you must ensure that your website and other content are translated reliably and without any mistakes. Exploring and understanding your chosen market completely, before committing to expansion is nothing short of essential. From understanding your competitors, market saturation and consumer behaviour to tailoring marketing campaigns and translating your content, an in-depth analysis and plan can indeed prove to be indispensable. A number of companies, such as IKEA or TESCO, approached foreign markets without a prior in-depth examination of the chosen country/market, which turned out to be extremely costly, not only budget, but also company-image wise. While IKEA expanded into Japan, which is a very different market from Ikea’s home, Tesco decided to expand into USA, which, would at first appear to be a very similar market to the United Kingdom, Tesco’s home market, yet, as it turned out, nothing could be further from the truth. You can read more about these cases here and here. Lastly, a competently conducted marketing campaign can be a challenge even in the business’s home country, let along abroad. Before preparing any marketing material, you must take into the account all of the above points and ensure that your content and messages will be suitable and appropriate for the target audience. Your company will not only have to translate or even trans-create the content, but the message will have to be fully localised, taking into account not only words, but also other aspects of the campaign, such as colours, sounds etc. These may symbolise different things in different cultures and countries, and so ensure to let your translation agency know this before proceeding. As you can see, there are many factors business owners must pay close attention to when approaching foreign markets. From understanding the chosen market, competitors and potential customers to translating materials and documents, localising the company website and marketing campaign, you’ll have to overcome a number of different obstacles before successfully growing your brand abroad. Nonetheless, with careful planning, approach and help from a translation agency, the rewards can be truly remarkable. You could double or even triple your business revenue with the right software solution. Andrew Lobel, Managing Director of Magora UK, shares the secrets of leveraging competition. Andrew, tell us a bit about the company. What distinguishes Magora from other UK developers? That’s simple. We treat each project as our own. We don’t follow existing paths but create new highways for our clients. We offer not just programming but fully-fledged business development. We create opportunities for each of our partners, helping them keep ahead of competitors by developing a digital environment where clients get to know the products or services online, without a middleman. Breaking the classical approach allows us to provide new business opportunities. What would you recommend to entrepreneurs to become successful? Stop doing the same silly things. Do not be afraid of becoming the innovator, of doing a lot of cut-and-tries [market tests] to find the best original solution. Bring your crazy ideas to life. All Magora team members firmly believe that technical progress can bring benefits to any entrepreneur. And to help business people like you come closer to your dreams and give you the chance to be creative and successful (and to save a lot of money via business optimisation at the same time), we’ve launched a series of free webinars dedicated to business digitisation. Our senior business development consultant James Watkins discusses different approaches to digital transformation, outlining new ways to increase profits, and reveals success stories of world-famous brands. Who would you recommend the webinar to and how do they go about joining it? Anyone who wants to get a clearer vision of how their business can become twice as profitable with the help of information technologies. To find hidden opportunities for your enterprise, join the next Magora webinar on 5th April 2018 at 16:00 (GMT). Participants will get answers to their questions and along with James will draft a step-by-step plan for business growth with bespoke software for their own company. Register for a webinar here. Blockchain technology is very much in vogue right now. While Blockchain can be used for a variety of useful and beneficial purposes, its most prominent use at the moment is in cryptocurrencies. These digital currencies rely on Blockchain technology to function, but while they might all share this aspect of their DNA, each cryptocurrency is different from the last. Monero is one of these Blockchain based cryptocurrencies. On their website, the developers describe Monero as being an untraceable, secure, and above all, private, cryptocurrency system. Monero claims that by using a proprietary cryptographic process, they are able to maintain the total privacy and security of all the transactions made through the network. In today’s world, where transparency is becoming the standard, the appeal of Monero is easy to understand. CryptoNote is a protocol used in a number of different decentralized currencies. It doesn’t support the biggest cryptocurrency of them all, Bitcoin, but it is very similar in nature to the application layer protocol that is used with Bitcoin. The first currency to make use of CryptoNote was Bytecoin. Bytecoin displayed initial signs of promise, but before long, a number of users were flagging up some shady goings-on. Because of these, and with 80% of Bytecoins already published, it was decided that Bytecoin would be forked. The coins in the new chain which resulted from this forking were called Bitmonero, eventually being shortened to just Monero. At the helm of Monero is a team that consists of seven developers, five of whom have opted to remain anonymous. With so many different cryptocurrencies out there, many people find themselves wondering what exactly is the difference between them. In the case of Monero, its biggest selling points come from the properties of the CryptoNote algorithm. First of all, customers using Monero have complete control over all of their transactions. Monero offers all the privacy and security that you could want in a digital currency platform. If you are looking to invest in cryptocurrencies, then Monero is a good one to start with. You can find a Monero price guide here. Another selling point of Monero is that it is fungible. Fungibility is a measure of how interchangeable a particular asset is with other goods or assets that are the same type. To understand fungibility, consider a simple example. If a friend lends you $50 as two $20 and a $10, and you repay them with a $20, a $10 bill, and four $5 bills, then they aren’t going to mind. In this example, the dollar has fungible properties. Finally, Monero is dynamically scalable. Scalability is a hot-button issue in the world of cryptocurrency, especially over the last few months. Unlike Bitcoin, Monero has no pre-defined block size limit. This isn’t something that the average user will notice, but Monero’s block reward penalty, which is built into the system, is effective in achieving what other cryptos accomplish with their block size limit. Cryptocurrencies have really taken off over the last few years and Monero represents another innovative step along this exciting new tech path. There is no doubting the fact that education can lead to a more successful career. For a lot of young Brits, this has always been a factor that compels them to finish higher education degrees and look for jobs in either the public or private sectors. Evidently, this has been proven by figures showing how more and more people are pursuing their respective specializations in various universities. Funding for state-run institutions remains to be robust, showing a potential spike in graduation rates in the foreseeable future. Still, the issue of giving students a chance to pursue their own career paths doesn’t end in them obtaining their diplomas. To a certain degree, a lot has to be considered when it comes down to providing new graduates with jobs and still a lot more when it comes down to helping them settle. For their part, fresh graduates who have just started working in their first jobs will have to make sure they survive with the meager entry-level salaries they have to work with. That being said, it is important for them to manage their finances wisely and avoid a sloppy start in their paths to professional success. For many newly graduates, the world of “adulting” is a scary place to be. The main reason for this is financial management. For some reason, young adults struggle with keeping their finances in line. But really, it’s only a simple matter of tracking your expenses. It couldn’t be that hard, but considering how easy it is to squander a month’s worth of work inside a pub, newly hired graduates will have to exercise a bit of self-control. Luckily, there are tons of financial planning apps online that can help them keep tabs of their spending and make wiser purchasing decisions. Saving money is as important as job security. And in such a precarious economic environment, newly hired employees should start securing their finances as early as possible. In this case, they can open deposit accounts that generate interest overtime. Once you get your first paycheck, allocate a certain portion to it to this account and make sure to do same with each subsequent pay. If time is in your favor, you can actually pursue extra work on the side to enhance your cash flow. A lot of graduates, after all, take part as online freelancers, rendering their services in creative areas such as graphics designing and more technical areas such as consultancy. There will be cases in which you have to sacrifice a month’s paycheck, cases such as home emergencies or a burglary. These scenarios will dry out your funds, so you have to wait until you get your next salary. Fortunately, you can avail of services like payday loans that you can get for low interest rates. These also come in handy when you have a ton of bills to pay, an apartment to move into, or to survive the long wait.